Fly Fox Productions: A Review of Mr. Holmes. 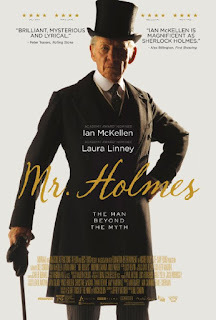 A Review of Mr. Holmes. Mr. Holmes. A postmodern/poststructural look at a postmodernist film that behaves postmodernly because postmodernism is dumb. Way to see the changes that bring life to words. A way to see that absolutes are no more than conventions. Such words bean only the beaniest of contraptions, stifling the webs and morsels. Laws are gone, hail to the temporality of morality. Well that was chore. The absurd nonsense above would have gotten me high praise in my college poetry class. Poetry and fiction writing were topics I thoroughly enjoyed studying in college. I took poetry far more than I perhaps should have, especially since I was a science major. The prevailing idea within these classes was that form and structure were old fashioned and quaint, but early on I had a professor who could appreciate both form and more abstract things. When I took an advanced class I found that turning in my metered, rhyming poetry on which I had spent a great deal of time was essentially laughed at. So I decided to do an experiment, I wrote a poem in a more abstract nonsensical way. I had done things like this before, but this time I wanted to see just how far people would go to reject traditional poetry. I had a certain idea in mind about the meaning of the poem but the words did very little to convey that message. The response was enormous with people hailing it as the best thing I had done in the class, some saying that it was far better than any of my other poems. This whole thing served to illustrate to me the bankruptcy of postmodernism. Each individual thought they were rebelling against “the system” in rejecting classicalism but instead they had merely bought into the lie that there are no absolutes and joined the masses on their march to Nihilism. You might wonder why I’ve started out this critique of a movie that claims to be about Sherlock Holmes with a discussion of postmodernism and my aversion to it. The answer is simple the very things that I detest about postmodernism, mainly its rejection of absolute morality, is on full display in this abomination of a film. As Christians we hold to the idea that morality stems from God’s holiness and his moral law is a reflection and exposition of that holiness. This should impact our worldview so much that we look at everything dealing through the lenses of scripture. We should champion the cause of Christ and delight in God’s law, and thus we cannot embrace the postmodern culture of death. Mr. Holmes is a 2015 British drama starring famed actor Sir Ian Mckellen and is based off of a 2005 novel by American author Mitch Cullin. The film starts out innocent enough albeit on sad note with an aging Holmes slipping into dementia. The main plot revolves around Holmes’s desire to remember the last case he worked on and the events that caused him to give up his detective work. He knows only that his old friend John Watson embellished the story and changed the facts when he wrote the details down. While Holmes is trying to accomplish this task of remembering the case he befriends the son of his housekeeper and through the friendship begins to remember details about the case. On the surface the plot seems to be a decent one, the idea of an aging Holmes solving one last case while battling a failing mind is compelling, but by the end of the film we see that this plot line is really just a façade used to obfuscate the morality of the film. The details of the case that Holmes is striving to follow are presented through flashbacks. We see that he was hired by a woman’s husband to follow her and discover why she is acting so differently after having two miscarriages. Any intelligent person could understand the woman’s depression but the film glosses over the simple answer to the man’s problem, to simply seek out help, in order to have Holmes follow the woman to various places and do “detecting.” Little is done by way of deduction instead we see Holmes following the woman and seeing her do suspicious things, which make it clear that she is preparing to kill herself. Holmes finally confronts the woman revealing that he knows her plans and that she needn’t do go through with them. The woman listens and then offers to run away with Holmes. Holmes reluctantly declines, wishing that he could run away with woman. The woman leaves and later kills herself. Another plot line is given in the film. Holmes is trying to combat his growing dementia by trying various remedies, which leads him to Japan to find a certain type of plant. The Japanese man who helps him reveals to Holmes that he had ulterior motives in helping Holmes. It seems that the man’s father been a diplomat of sorts to England. He ultimately had abandoned his family and written a letter saying that he had spoken to Holmes, and that Holmes had said that he was needed in some capacity in England and that the best course of action would be to leave his family behind. Holmes bluntly tells the man that his father abandoned his family and lied about speaking to Holmes in order to explain away the abandonment. As Holmes remembers his last case a genuine touching story unfolds between the housekeeper, her son, and Holmes. This plot line seems rather well done and finds itself ruined by the last part of the film. After remembering his last case he realizes that he quit detective work because he thought that his logic had contributed to the woman’s death and he wished that he had run away with her instead. The film presents this desire that Holmes had to run away with the woman as neutral, not taking into account the adultery that would result from their actions. This isn’t too unexpected of a thing in a modern film, as most people do not view adultery as a sin. However the problems with the film’s morality do not stop at that. Holmes realizes that Watson had changed the story to provide a comfortable lie to the woman’s husband in order that he might not blame himself for the woman’s death. Holmes comes to believe that these lies, both his telling the woman that he did not want to run off with her and Watson’s lies about the details of the case are preferable to the actual reality and facts. Holmes then writes a letter to the Japanese man wherein he lies saying that he had in fact remembered the encounter with the man’s father and that the man served the British Empire faithfully and deeply missed his family. Holmes views this as the same type of kindness that Watson had done for the woman’s husband. This culmination of the movie produced nothing in me but disdain and some simple outrage that I had wasted my time. The postmodernity of the film is such: mainly that true morality doesn’t exist beyond people’s own desires, that facts and reality are nebulous concepts that ultimately hurt people and that lies are a far better reality altogether. I find this moral lesson to be sickening. It shows the degradation of our culture and the loss of critical thinking that many people have failed to see this film for what it is, a display of the rejection of God’s law and an embracing of postmodern apostasy. I cannot in good conscience recommend this film to anyone. If you want to see Sherlock Holmes detecting and solving crimes watch anything other than this drivel. I give the film 1½ stars out of 5. Buy this instead of Mr. Holmes.